The focus of pharmacological interventions has experienced a shift over recent years, with a greater emphasis placed on addressing lifestyle conditions than on fighting infectious diseases. Lifestyle conditions, or noncommunicable diseases (NCDs), include obesity, type 2 diabetes mellitus, cardiovascular disease and atherosclerosis . There is a pressing need within public health to understand and tackle the human behaviours that promote these types of diseases. Most of us are aware of obesity in the context of prevalent lifestyle diseases because it is a recurring theme within the news and the global media. Over the past 25 years, the rate of obesity has more than doubled in the UK, and today, almost 25% of adults in England are obese . This contributes heavily to the estimated global figure of 3.4 million annual deaths caused by excess weight . While obesity is dictated by genetic and environmental factors, it is not a surprise that the increase in prevalence owes mainly to environmental changes promoting both an intake of calorie-dense foods and a reduction in physical activity. However, merely possessing the knowledge of what constitutes healthy nutrition and physical activity does not appear to be sufficient in stopping the obesity epidemic . Considering that our environment is unlikely to change for the ‘healthier’, a more systematic response, inclusive of behaviours that cause obesity or other lifestyle conditions, is needed to address the issue. The health communications industry plays a pivotal role in our journey towards health and well-being, so it is key in the efforts to drive positive behaviour change. By successfully incorporating learnings from the field of behavioural science into communications, health messaging can become even more targeted and effective . For this to happen, stakeholder insights cannot just be about asking consumers simple questions, but also observing their behaviours through the use of digital ethnography . This dawning era of health communications recognises that human behaviour is determined by a whole range of factors, including personal, cultural, environmental and social parameters, and that to build informed and effective communication programmes, a robust understanding of the barriers to and triggers of healthy behaviour are essential . To be effective, communication strategies aimed at changing behaviour must to be rooted in relevant theories and frameworks . One such model is the Behaviour Change Wheel (BCW), a comprehensive theory-based framework developed by Professor Susan Michie at University College London (UCL). The BCW is a method for “characterising and designing behaviour change interventions” . At the centre of the wheel are the behaviours in question, surrounded by the sources of behaviour: capability, opportunity and motivation. These pre-exist in the COM-B (capability, opportunity, motivation and behaviour) model, in which at least one of the three sources of behaviour must be altered for the behaviour to change. 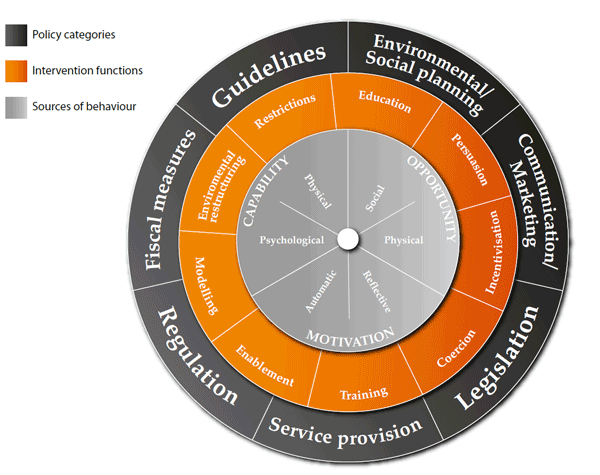 In the BCW, nine intervention functions and seven policy categories surround the sources of behaviour. The wheel is structured such that each policy category links to more than one intervention function; however, not every intervention function is relevant for each of the policy categories. For example, service provision (a policy category) is linked to all intervention functions except restrictions and environmental restructuring. A further policy, communication/marketing, is defined as “using print, electronic, telephonic or broadcast media”. It directly feeds into some intervention functions of the wheel, such as education, persuasion and incentivisation, which happen to be key aims of the health communications industry. For more information on the structure and function of the BCW, please see Professor Susan Michie’s research paper . Professor Susan Michie’s Behaviour Change Wheel. Adapted from Michie S et al. 2011 . The BCW framework can be adopted for use within communication strategies to modify disease‑promoting behaviour. For example, scientists from the Universityof Warwick and Coventry University undertook a project to modify behaviours involved in childhood obesity by creating an app to promote healthy eating. They identified that the main behaviour to target was the provision of inappropriate portion sizes by parents . The overall concept of the app was to guide parents in providing their children with healthy, balanced meals, using a range of features, such as interactive quizzes, tools to guide portion sizes and in-app notifications. Thus, a systematic and comprehensive model was used to underpin a health communication programme. In isolation, healthcare communication programmes cannot fix all our unhealthy behaviours overnight; often, such behaviours are deeply ingrained within our social norms. Moreover, we do not live in a bubble; we are constantly influenced by the media and by the abundance of social interactions we face on a daily basis . However, for specific conditions, gaining a deeper understanding of health behaviours (and what motivates or prevents them) and combining this with the relevant scientific model to pinpoint the most effective communication programme or intervention provides an effective means of promoting well-being. If you would like to find out more about the Porterhouse approach to generating insights and designing effective communication programmes, contact: mark@porterhouse.biz. 1. World Health Organization. Noncommunicable diseases (fact sheet 355). Available at: http://www.who.int/mediacentre/factsheets/fs355/en/. Accessed February 2018. 2. NHS Choices. Britain: ‘the fat man of Europe’. Available at: https://www.nhs.uk/Livewell/loseweight/Pages/statistics-and-causes-of-the-obesity-epidemic-in-the-UK.... Accessed February 2018. 3. Ng M, Fleming T, Robinson M et al. Global, regional, and national prevalence of overweight and obesity in children and adults during 1980–2013: A systematic analysis for the Global Burden of Disease Study 2013. Lancet 2014; 384 (9945): 766–781. 4. Dalle Grave R, Centis E, Marzocchi R et al. Major factors for facilitating change in behavioral strategies to reduce obesity. Psychol Res Behav Manag 2013; 6: 101–110. 5. McCann Health. Applying the science of behavior change. Available at: http://www.mccannhealth.com/healthy-rewards-good-behavior/. Accessed February 2018. 6. PMLiVE. Harnessing the power of ethnography in healthcare. Available at: http://www.pmlive.com/pharma_intelligence/harnessing_the_power_of_ethnography_in_healthcare_951930. Accessed February 2018. 7. APCO Worldwide. The role of health communications in behavior change. Available at: http://www.apcoworldwide.com/blog/detail/apcoforum/2015/02/12/the-role-of-health-communications-in-b.... Accessed February 2018. 8. Michie S, van Stralen MM and West R. The behaviour change wheel: A new method for characterising and designing behaviour change interventions. Implement Sci 2011; 6: 42. 9. Curtis K, Lahiri S and Brown KE. Targeting parents for childhood weight management: Development of a theory-driven and user-centered healthy eating app. JMIR Mhealth Uhealth 2015; 3 (2): e69. 10. PMLiVE. Stepping out. Available at: http://www.pmlive.com/pharma_intelligence/stepping_out_1210702. Accessed February 2018.